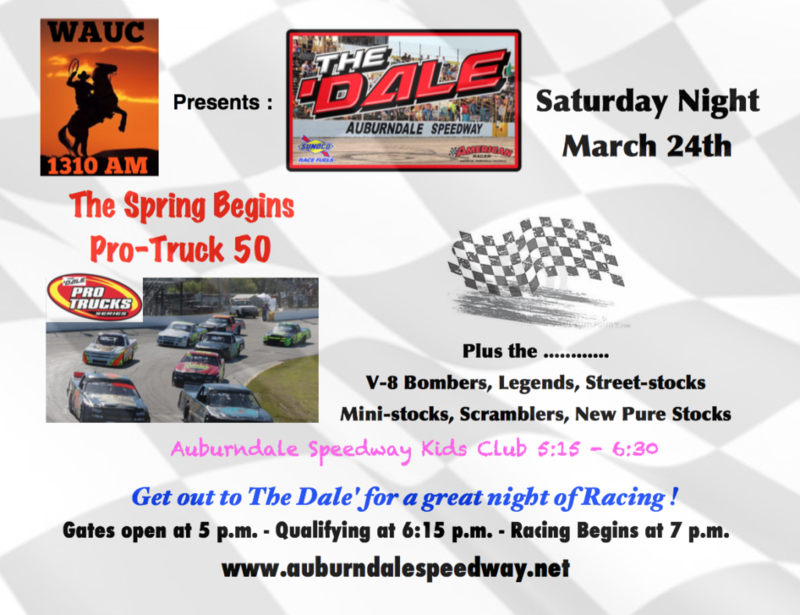 Auburndale Speedway returns to action this Saturday night with a full program featuring seven classes of race cars… and Trucks. V-8 Bombers, Q Mini Stocks, Scramblers and the new Pure Stock division. Among the Pro Truck drivers expected are Cody McDuffie of Bartow, winner of the first Pro Truck race of the season back on January 27th, Jason Lester of Palmetto, the Windermere father/son duo of Todd and Nick Haag, Derek Pugh of West Palm Beach, Lakeland drivers Colt Cecil and Tyler Davis along with William Kerns of Auburndale among others. For the local classes, current point leaders are Jim Smith (Legends), James Wright III (V-8 Bombers), Steven O’Steen (Street Stocks), Chris Narramore, Sr.
(Q Mini Stocks) and Andy Travis (Scramblers). Pit gates open at 3 pm with practice slated from 3:30-5:45 pm. Grandstand gates open at 5 pm and qualifying for the Pro Trucks is slated for 6:15 pm. Racing begins at 7 pm with 8-lap heat races for the Legend Cars, Q Mini Stocks, V-8 Bombers, Street Stocks, Scramblers and Pure Stocks. Intermission will feature an autograph session on the front stretch with the Pro Truck drivers then it’s time to go feature racing starting out with a 25-lap run for the Legend Cars followed by a 20-lap contest for the Q Mini Stocks. The V-8 Bombers are up next for 25 laps followed by the Scrambler and Pure Stock features. The evening concludes with the Spring Begins 50 for the Pro Trucks. 55+ $13. Children ages 5-12 are only $5 and all kids 4 and under get in free. The family 4-pack is just $32 for two adult and two children’s admissions (a $40 value). Pit passes are $30 per person and all parking is free.